Are you looking for Current Police Procedurals for the Film/TV/GamingVideo Industry? Thirty two year police veteran, Sergeant Don Gulla, and his Law Enforcement contacts, can give you a fresh, behind the scenes look of everyday Police Procedures, Street Gangs, Terrorist Acts, SWAT Operations, Combatives, Weapons, Taser, Homicide Investigation, Critical Incident Survival, Hostage Negotiations, and how to do them SAFELY. We have experts in every Law Enforcement area to meet your needs. Fast and effective. Using a layer approach of SIRT Training Pistol/Bolt, Simmunitions and Live Fire (If needed). Want to move and handle weapons like a pro, SAFELY in a short period of time! The difference between a novice and an expert is how they move, handle and manipulate the weapons they use. Ever seen the actors that blink every time they shoot? Every shooter watching does! Live fire on the range doesn’t provide the needed time or skills for the realistic scenes. Trainees will be provided SIRT Pistols and safety training for self practice off location. Fifteen years and over 600 SWAT Missions. 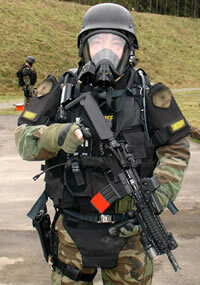 Skilled in SWAT Helicopter Operations, Maritime Boarding Tactics, Hostage Rescue, Dynamic Entry, Warrant Service, Bus Assaults, School Active Shooter, Vehicle Takedowns, Breaching Techniques, and all Equipment used by SWAT Teams. Assignments have the 1990 Goodwill Games Anti Terrorist Unit, Security for the 1996 Atlanta and the 2002 Salt Lake Olympic Games, Guarding High Profile Suspects, including the Green River Killer, and VIP Protection. 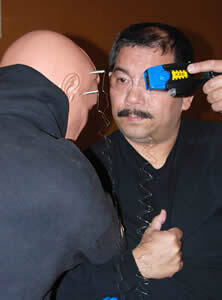 Senior Master Taser Instructor. www.Taser.com. Proficient in demonstrating and deploying all Taser weapons and cartridges, including Taser XREP Shotgun Round, C2 Civilian Taser, Taser Shockwave, Taser Irobot, Taser X-26, M-26, and Training Non-Electrified Probes. Taser Coordinator for a large County Sheriff’s Office, Taser Armorer, In-Custody Death Instructor, and qualified as a Taser expert in court. Combative Arts practitioner for over 48 years. Multiple Black Belt holder and a five time World Police and Fire Games Karate Gold Medalist. Master Defensive Tactics Instructor. Instructor for ASLET, American Society of Law Enforcement Trainers, and ILEETA, International Law Enforcement Educators and Trainers Association, IALEFI – International Association of Law Enforcement Firearms Instructors. Trainer of many Mixed Martial Arts fighters. Founder of the Police Art of Arrestling in 1990, which has become nationally known for its progressive training and street proven techniques. Selected in 2007 to teach Arrestling to Russian Police and Omon/Swat Instructors at the Shakalin Island Police Academy, Yuzhno, Russia. Proficient in demonstrating and teaching use of blowguns, knives, and throwing edged weapons. Designer of V.E.S.T., Violent Encounter Survival Training for the Washington State Criminal Justice Training Commission. 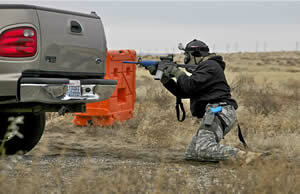 Author of Advanced Ground Survival and Weapon Retention Instructor Manuals. 2009 Technical Advisor for the newly formed Guns & Hoses Police/Fire Submission Grappling League, consisting of twenty Police, Fire, and Military teams. Coach of the Pacific Northwest Team, TAPNW Arrestlers. Founder of Arrestling International Mixed Martial Arts. Experienced Range Instructor/Safety Officer and Glock Armorer. Certified Instructor for Level I and II Handgun, Shotgun, and Urban Rifle. 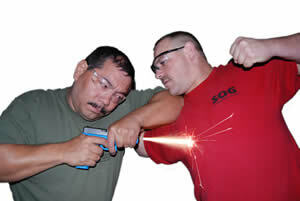 Certified Simmunition Instructor capable of converting weapons for Simmunition Secure Blanks and FX Rounds. Conductor of hundreds of mock scenarios using Simmunition and Airsoft. Currently using SIRT Training Pistols and SIRT Bolt for Firearms, Defensive Tactics and Scenario Training. Knife and Stick Arnis Instructor. Washington State Police Academy instructor for seven years teaching Crisis Intervention, Traffic Enforcement, Criminal Investigation, Patrol Procedures, and Defensive Tactics. 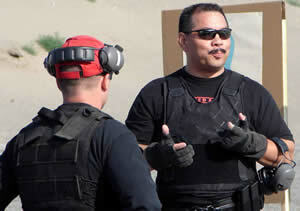 Riot Control Instructor and Lead Instructor for Civil Response Team. Trained four hundred officers prior to the Seattle World Trade Organization riots and was assigned to a SWAT Hostage/Officer Rescue Team. High Speed Vehicle Pursuit Instructor, Pursuit Intervention Tactic Instructor, PIT, with the ability to demonstrate and setup PIT technique on suspect vehicles. Tactical Vehicle Takedowns and Assault. Supervisor for Hostage/Crisis Negotiations Team. Coordinator and Trainer of Crisis Intervention Team Training. Current Instructor for : Mental Health First Aid, Corrections CIT, Dispatch CIT, Youth CIT and CIT Force Options. These areas help Law Enforcement Officers deal with the Mentally Ill and Drug Dependent Individuals. Verbal De-escalation Tactics, Resources, Suicide by Cop, Excited Delirium and Dealing with Veterans with PTSD are covered. At the CIT International Conference Don presented on the topics of Suicide by Cop and Self De-escalation for Law Enforcement.